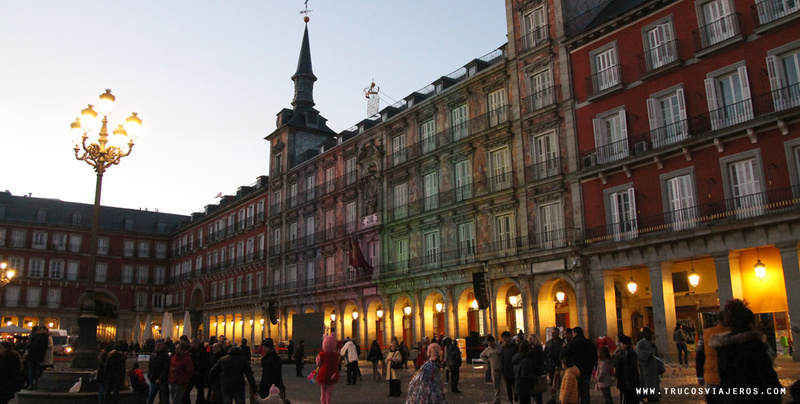 You’ve been asking me a lot lately if it is worth visiting Madrid during a layover. It always depends on the timing and whether you are adventurous enough to go out of the airport. But even if you are not, there are more options that it might seem at first sight. You must be at your boarding gate 30 minutes before the flight departure time and moving from one boarding gate to another could take you up to 20 minutes (if you are going from T4 to T4S or from T1 to T2) or about 40 minutes (if between T1/T2 to T4, you can calculate the time at this post)… so you won’t be having lots of “free” time. If you want to go shopping, at T4 you will find many shops, such as the spanish brands Zara, mango, Trucco or Uterqüe and some International brands. Also duty frees and some original spots like the Chocolat Factory, Sibarium (with hams and olive oil) or the Real Madrid official shop. They also have a few cafes, restaurants and some fast food options. T4S has fewer options, but you could try going from T4S to T4 if you have some spare time. T1, T2 and T3 are connected at the boarding side, so you can move from one to the other more easily. They also have plenty of shops, but with more international options and food variety. And if you are traveling with kids, there are play areas and some rooms where you can heat baby food in all terminal buildings. I wouldn’t risk it going downtown and back (it would take you almost 3 hours to leave the airport, arrive at Madrid’s Puerta del Sol and come back in time to board) so I wouldn’t recommend leaving if you have less than 4 hours. Another option is to connect to the free wifi of the airport or using the Internet points (pay) that are located at the T2. You will also find plugs and TVs all around the airport. I wouldn’t doubt it: leave your luggage at the lockers (you have them at Terminals 2 and 4, but also at major train stations) and go discover Madrid! All public transport options take you downtown, but ignore metro, taxi or bus, and take the train at T4 to Atocha or Sol station (I tell you more about how to go to the airport by public transport here.) Then you can move to major touristic spots such as Prado Museum, Plaza Mayor or Cibeles by foot (Madrid is mostly flat) or by underground and buses. If you are into soccer, you can go to Real Madrid’s stadium by metro or taxi and take the guided visit. And if you want to go to the new Wanda Metropolitano stadium from Atletico de Madrid, you can also go by bus (the 200 bus and then change or walk 15 minutes from Canillejas). And if you already know the major spots and don’t feel like going deeper (don’t know why, but just in case) you have close by World Heritage Site and Cervantes’ home town: Alcalá de Henares. It is connected by bus with the T1-T2-T3 by bus (every 40 minutes and takes 40 minutes to get you there) or by taxi for about half an hour and 40 euros. A guided visit of the city. You have them free, themed and even self-guided ones. Check the ones available in your language at Civitatis, Getyourguide or Viator (sadly most of them are in Spanish only). Enjoy Madrid’s gastronomy (I’ve told you about it at this post) or through the food markets of San Antón, San Miguel or San Ildefonso. The AirRooms, the only “hotel” that is inside the airport in Madrid. I would say it is way too expensive for what it is, but if you don’t have much time, it might be your only option. Or at any of the hotels with free transfer service that are close to the airport (but not inside or at a walking distance). They are generally cheaper, have gym and, in most cases have open air swimming pools that are perfect for the summer. I tell you more about these at best hotels near Madrid airport.